2 passes, 2 friends, 1 instructor! 2 good friends both had Driving Lessons in Paignton with The Driving School sw with the same Driving Instructor…….. So the pressure was on today. ? 2 pupils, same test time. ? This is Jack who kept his cool and passed his Driving Test first time with only 4 driver faults. Fantastic result from both pupils. 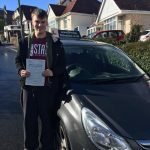 For Driving Lessons in Paignton, Torquay, Brixham, Netwon Abbot & surrounding areas call 01803 640607 or visit www.thedrivingschoolsw.co.uk.